Alaska's Arctic is an extreme, wilderness landscape, inhabited by animals that have adapted to life in a harsh climate. The wildlife species that live there have adapted unique characteristics to deal with life in the winter months of brutal cold and blowing snow where temperatures can plummet to minus 50 degrees and colder. next » | 132 sample images from this category. Try a keyword search to see them all. Grizzly bear in yellow willows, Seward Peninsula, Alaska. Atigun canyon, Brooks Range, Arctic, Alaska. Yellow-billed loon swims in Toolik lake in Alaska's arctic. Close up view of a bull muskox and its horn, Arctic North Slope, Alaska. Male spruce grouse in boreal forest, arctic, Alaska. 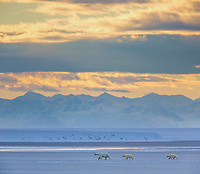 Beaufort Sea, Arctic National Wildlife Refuge, Alaska. Cow moose with twin calves in the spring green grasses, Alaska. Bull Musk Ox on Alaska's snowy Arctic Coastal Plain. Arctic tern hovering in flight, Alaska Range, Interior, Alaska. Snowshoe hare in white winter fur, Brooks Range, Alaska. Polar bear on the Beaufort Sea Ice in Arctic, Alaska. Snow bunting on snow, Arctic, Alaska. 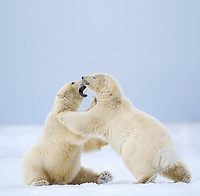 Cubs play on the Beaufort Sea ice, Arctic National Wildlife Refuge, Alaska. Snowshoe hare in boreal forest, interior Alaska. Bull Musk oxen on Alaska's Arctic North Slope. Willow ptarmigan on the snowy tundra of the Alaska Arctic. Arctic fox, Barter Island, Arctic National Wildlife Refuge, Alaska. 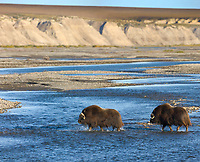 Muskox on Alaska's arctic north slope. Barren ground caribou run along the Arctic Coastal Plains, Arctic Alaska. Cross fox hunts on the snowy tundra of the Arctic North Slope, Alaska. Bull moose on the tundra by the Trans Alaska Oil Pipeline, Arctric, Alaska. Tundra of the Arctic North Slope, Alaska. Cow moose and calf along the Koyukuk River, Brooks Range, Arctic, Alaska. Bull muskox on the snowy tundra of the Arctic coastal plain, Alaska. Male Pine grosbeak, Arctic, Alaska. Red Fox on the snowy tundra of Alaska arctic north slope.